Mark Bielski is an historian, author, and the Director at Stephen Ambrose Historical Tours. He is also the host of History with Mark Bielski, a podcast where he discusses history from ancient to modern times with experts in their field, with special attention to the Civil War and WWII. He leaves the textbooks behind and delves into the characters, backstories and often the intrigues that drove events throughout history. Mark’s career has involved academics, history and literature, journalism and publication writing as well as corporate management. 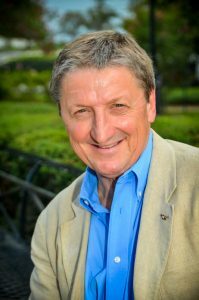 As the director at Stephen Ambrose Historical Tours, he is involved in business and educational development, historical guiding, lecturing and itinerary design for tours that primarily involve World War II in Europe and the American Civil War. The privileges and pleasures of Mark’s work are having the opportunity to interview and travel with numerous veterans and their families from WWII, Viet Nam and other conflicts. He is currently working on a second book about Stonewall Jackson. This fictional account of the circumstances surrounding Jackson’s death has intrigued him for a long time. Mark’s media experience ranges from interviews with Tammy Bruce and a discussion with Tom Brokaw at the Churchill War Rooms in London, to writing for civilwar.com and presentations at symposia, to being an editor of a magazine. He is a member of the American Historical Association, the Society for Military History and the Lewis & Clark Trail Heritage Foundation. He received his Ph.D. in History at the University of Birmingham, England as well as an M.A. and B.A. in English from Georgetown University and Tulane University respectively. Mark lives in New Orleans, where he enjoys the city’s culinary, cultural and musical riches on a daily basis.